It is what one could call a lose-lose deal. 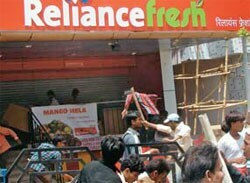 Unable to overcome protests from middlemen and traders in Uttar Pradesh, Reliance Retail has decided to discontinue its fresh produce business under the Reliance Fresh brand in the state. It’s a move that helps neither Reliance nor the state. Reliance Retail, which operates the Reliance Fresh format, has invested close to Rs 3,000 crore in Uttar Pradesh for its back-end infrastructure, which includes construction of national and city distribution centres, processing centres for collection and processing of produce from farms, and precooling facilities and refrigerated vans. Over the last three months, Reliance has not just stopped procuring but also shut all 44 Fresh outlets in the state. Apart from the Fresh stores, the company has just one Reliance Digital outlet in Gaziabad and says it currently has no plans for other formats in the state. But “the company is always on an expansion path,” says Raghu Pillai, President & Chief Executive, Reliance Retail, adding that the retailer will expand in other states. Reliance Retail is said to have leased 158 properties in the state for Reliance Fresh. All these leases are on hold. “We cannot convert these spaces into other formats as they are too small (2,400-6,000 sq. ft) for formats like Home, Trendz, or Digital. Moreover, it does not make sense for us to open these formats in the existing catchments as they may not work there,” points out a company executive. “We are in dialogues with various parties to resolve the issues,” says Pillai. So, there’s hope yet.